Get into the groove of summer by throwing a fun and memorable pool party for your family and friends! Summer is the perfect season of time to host a pool party and offer guests the ultimate chance to cool off. Whether celebrating a birthday party or a general summer celebration, pool parties are always a hit during the heat. Instead of simply inviting guests to your pool party, consider hosting a full-fledged summer bash to turn your pool party into the main event by the event organizer. Opposite to popular belief, there are plenty of creative ways to give your pool party a themed and amazing look! Start your party planning process by choosing a party theme which will set the mood for your entire set-up. Decorative floats, themed party invitations, unique food ideas, and more will easily fall in place once you decide which direction to go in. Break out the Pina Coladas cocktail, inflatable palm trees, and coconuts for your breezy tropical pool party! This theme is an absolutely perfect for summertime weather and pool shenanigans. Deck your pool out with inflatable tropical fish, bright floats, parrots, and inflatable flamingo coasters, that all are perfect for crafting a fun and also a light-hearted atmosphere. In addition to pool decorations, add some natural color to your table areas by trying your hand at arranging tropical flowers such as Begonias, Dahlias, Alpinias, and Hibiscus flowers. When it comes to food, turn your party upside down with few favorites like jerk chicken, coconut rice, glazed pineapples, pineapple pork chops, and spiced shrimp. Lastly, you can customize any invitation to fit the needs to your pool party. 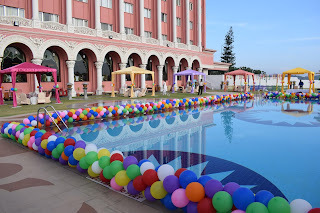 For this pool party go for best event management companies. Bring the pink color by giving a bright and fun flamingo pool party! This theme is all about using your imagination to incorporate the flamingo-oriented decor throughout all party decorations and pool set-up. You can also purchase pink flamingo ornaments for your yard or you can create own standing flamingos from scratch with paper and wooden sticks. Offer your guests delicious pink lemonade by way of a stylish lemonade stand that is complemented by plastic flamingo stirrers to add charm. You can also take your theme to the pool by providing guests with pink flamingo tubes and large flamingo floats. You can host an amazing “Under the Sea” themed pool party for your child if you are looking for fun birthday party ideas during the summer season. This theme is full of a decoration which is inspired by the ocean’s most popular creatures including colorful fish, crabs, sea turtles, octopus, and everyone’s favorite the mythical mermaid. Find floats and inflatables which encompass any of these creatures for an entertaining and spot-on pool party experience. You can also get creative with selecting your food by exploring “Under the Sea” inspired ideas such as starfish-shaped, blue jello in clear cups, sea- sandwiches, blue cake pops, and blue lemonade. You can also buy small sand buckets to house cute individual snacks for all of the children who are invited to the party. Choose a fun invitation, inspired by the ocean, with sea-styled graphics to set the tone for your child’s pool party. After choosing a pool party theme, you can adjust your decorations to match the beauty and sentiment of your theme. However, there are always a few essential items to include at any pool party. When it comes to daytime parties, be sure to stock up on beach balls for the pool, garlands, and also fresh summer flowers which match your party’s color palette. For making this pool party event successful the event organizer should have an extra measure of the security of the guests. If your pool party is at night, your decorations should be focused on lighting methods and illuminating your backyard area! You can go by hanging lights, lamps or a string of paper lanterns around the border of your pool. 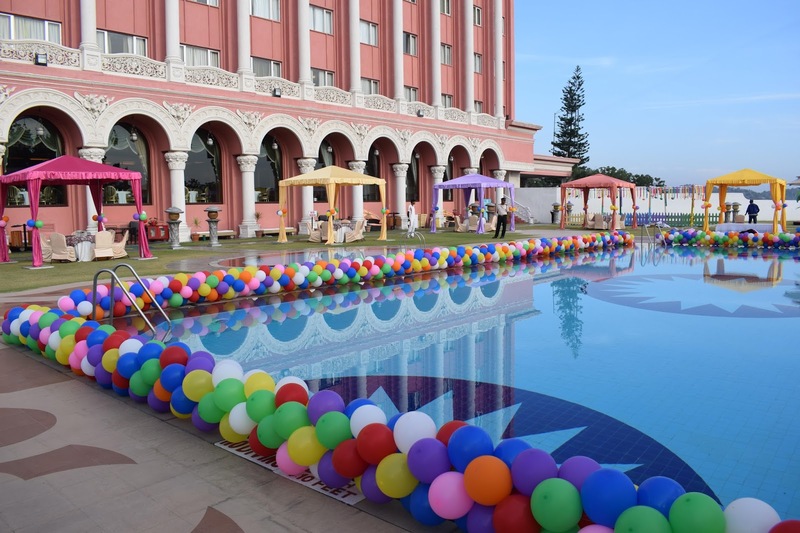 Choose best event management companies in India for amazing pool parties. Personalize these pool parties with fun summer quotes and add a nice touch to your pool party decor.